This Eclectic bathroom located in Media, PA is featuring traditional cherry cabinetry, rustic slate and custom made map tiles, and crisp black granite countertops. The traditional deep cherry finish of the cabinetry adds extra richness and warmth , while the multicolored slate floors add depth and texture to the Media, PA bathroom. Our clients in Media, PA love sailing. A decorative post next to the make-up area was salvaged and carved out of an old ship mast which was finished to blend with the rest of the cherry cabinetry. The warm cherry cabinets in this eclectic design in Media, PA give our clients plenty of storage between the double vanity and the make-up area. A separate make-up space was incorporated into this eclectic design, providing our clients with more storage and counter space. This eclectic design contrasts a period style wall mount chrome tub fill and hand spray with the natural clefted slate stone wall caped with a custom Pietra Cardosa window sill. The frameless glass shower enclosure in this eclectic design showcases the beautiful multi colored slate tile in the shower and gives the space a more open feel. Different layouts of the slate tile breaks up the repetition in this eclectic shower in Media, PA. Decorative tile inserts add dimensional interest, and the multi-toned slate adds warmth and character to the eclectic shower environment in this Media, PA bathroom. The recessed shower shelf was framed with slate tiles to make this area stand out in this eclectic shower in Media, PA. This eclectic cottage design in Doylestown, PA features a very elegant Victoria & Albert slipper tub, complimented by a period style wall mount chrome tub fill and hand spray. The floor shown is a natural clefted slate with radiant heat. This double vanity with matching medicine cabinets give this eclectic bathroom a crisp flair. This Doylestown, PA vanity is toped with honed Pietra Cardosa stone which pulls out the dark tones in the slate floor. This Doylestown, PA master bath showcases a custom bench with wood top and cut away toe kick, for extra storage. A separate lavatory room concealed by a French frosted glass pocket door is located to the right of the bench. This eclectic custom angled shower with frameless glass was designed with natural clefted slate for the flooring, and an island stone pebble inset boarder to match the shower floor. A tall linen closet and custom bench flank the shower. This eclectic design in Doylestown, PA features chrome lighting with an Edison bulb for a fun accent. This eclectic space in Holland, PA has a separate make-up area with matching green vanity and a vessel sink. The two privacy walls in this eclectic master in Holland, PA create a cascading effect with the slate tiles. The lower wall hides the toilet while the taller wall conceals the shower. Custom, flush inset, painted cabinets were chosen for this eclectic master in Holland, PA and accessorized with polished chrome decorative accents which give the typically traditional look a more transitional presentation. Natural slate tile was used in this eclectic design in Holland, PA. Using different sized tiles creates interest within the area. A recessed shelf was added to this eclectic design in Holland, PA. This eclectic master bath in Holland, Pa has a nice contrast between warm and cool. The tile throughout the bathroom is a warm textured slate tile, contrasting against the cool green cabinetry. The eclectic custom 3-Form acrylic panel hung with barn door hardware truly makes this a special entry into this Dresher, PA master bath. A direct wire illuminated 5x magnification mirror was added to this eclectic design which provides all the light required for makeup application. A honed white Carrara marble with a drop skirt was chosen to complement the rich mahogany wood used for the "his and hers" contemporary vanity. The simple Grohe faucets complete the look in this newly expanded Dresher, PA master bath. 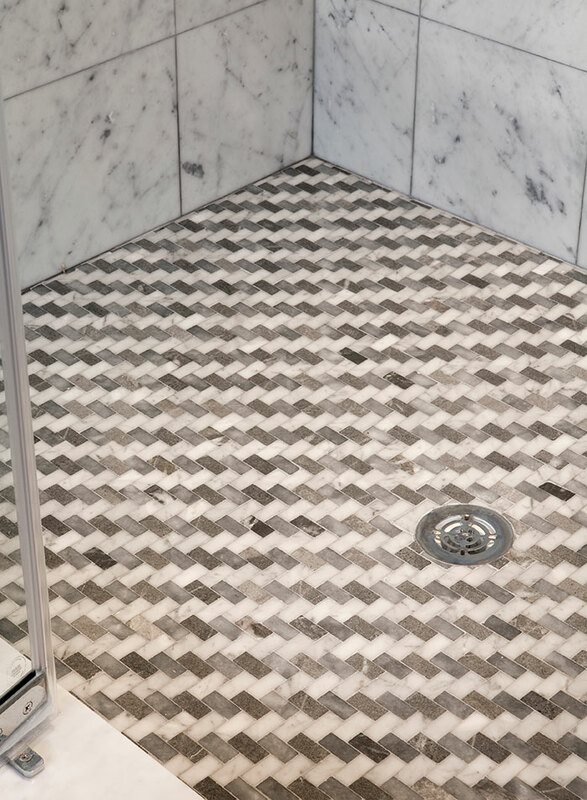 A complementary herringbone Carrara marble and Lagos Azul limestone pattern was used to blend color, giving the shower floor texture and presence in this Dresher, PA shower. Solid mahogany wood with espresso finish was featured for the "his and hers" vanity in this eclectic design in Dresher, PA. This creates a great contrast against the large format porcelain tile floors. Carrara marble and a herring bone mix of marble and Lagos limestone. A frameless shower panel and door system allows for more natural light to saturate the shower in this Dresher, PA master bath. This clean contemporary soaking tub with soap catty balances well with the large format porcelain tile floors and Carrara vanity in this Dresher, PA design. This clean contemporary soaking tub with balances well with the large format porcelain tile floors, chrome fixtures, and Carrara vanity in this Dresher, PA design. This 3-Form acrylic panel, hung with barn door hardware is the entrance to an eclectic master bath in Dresher, PA. This contemporary eclectic bath in Dresher, PA was enlarged to make way for a double vanity with Carrara marble counter tops, and chrome hardware.